A dinner out at Cascabel Taqueria (review to come) in New York City inspired us to try making some watermelon agua fresca at home and now Jen is hooked (it's become a thrice weekly ritual). It's so easy to make, I can't believe we've never thought of it. It works with almost any good summer fruit - oranges, limes, grapefuit, berries. 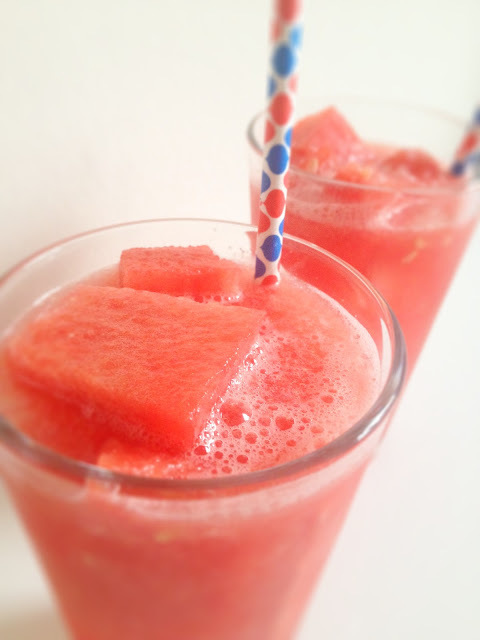 Recipe Card (PDF)Start with a good seedless watermelon (chilled if possible) and cut it into chunks. For about 6 cups of agua fresca, we used about 1/8th of a medium melon. Drop the chunks into a blender (use a good one that can crush ice for the best result) along with 6-10 ice cubes and 1/4 cup of agave (or other sweetener). Blend on a high crushing speed until near smooth - about 2 minutes - then add an equal amount of chilled seltzer water. Serve in tall glasses with 2 more ice cubes and a spear of watermelon. A good garnish is a sprig of mint or a cool straw (these were Jonathan Adler designed for Pepsi)...now sit back and enjoy! This is SO awesome that you're sharing your amazing food! I'm a big fan of Jen, and I'm so excited about your new blog. I have a feeling I'll be pinning about a million recipes from your blog! Yummy! Cant wait to try! And I love the recipe card tab, great idea. Love this recipe! So easy and perfect for a hot sunny day. Thanks for the recipe card. So excited to make this! Watermelon juice is my favorite. Can you clarify how much seltzer water? Thanks for the recipe. Look forward to trying out many of your recipes! The amount of seltzer is really to taste but usually we mix 1 part seltzer to 1 part melon (the above would make 3-4 C of juice, so add the same amount of seltzer). Same with sweetener - try different types because they can change the taste. Thanks!